Got a tissue? You’re going to need it……..for the tears. Where else on this planet could you drink a brilliant Sauternes, from the impeccable 2010 vintage, for less than the cost of a simple lunch? Or parking for 2 hours in San Francisco? What an absolutely incredible buy --- PLEASE, please, if you love the art of dessert, the art of pairing cheese and dessert wine, GO, go, go and snag this --- just an outrageous deal, while we have it, anyway!! First off, this is the little brother of the 95-POINT Sigalas Rabaud (which dates back to 1660…! ), a wine that you RARELY see outside of France (that’s why we have to go there every year, to dig these treasures up!!) --- it was never scored but it DELIVERS, big time. Picked slightly earlier than its older brother, it is sweet but RACY/FRESH, packed with ripe, sweet peach and apricot flavors, citrus oils, toasted coconut and a hint of vanilla...man, trust us, match this up with some fruit and cheese and you are DONE. $12 is simply incredible! To even HAVE this wine is….well, we’re out of words. Going to go fast!! Created from the same terroir as the first wine, Sigalas Rabaud, the Lieutenant de Sigalas differs from his older brother due to different Harvest dates. The distinction of the harvest dates allows the creation of a light wine with a great aromatic fineness! It is created with the same highly pure botrytis grapes. A perfectly ripe wine which pairs well with a nice meal. With a beautiful gold colour, this wine reveals a lovely fruity nose (citrus and white fruits notes). The attack is extremely fresh, the palate is full and elegant with citrus and white peach flavours. Serve at 10°C. Created in the seventeenth century, the land of Rabaud was acquired in 1863 by Henri de Sigalas. Forty years later, his only son, Pierre Gaston de Sigalas sold the majority of the estate. He only kept ” the jewel of Sigalas,” a south-facing gravelly slope which remains as the current 14 hectares. 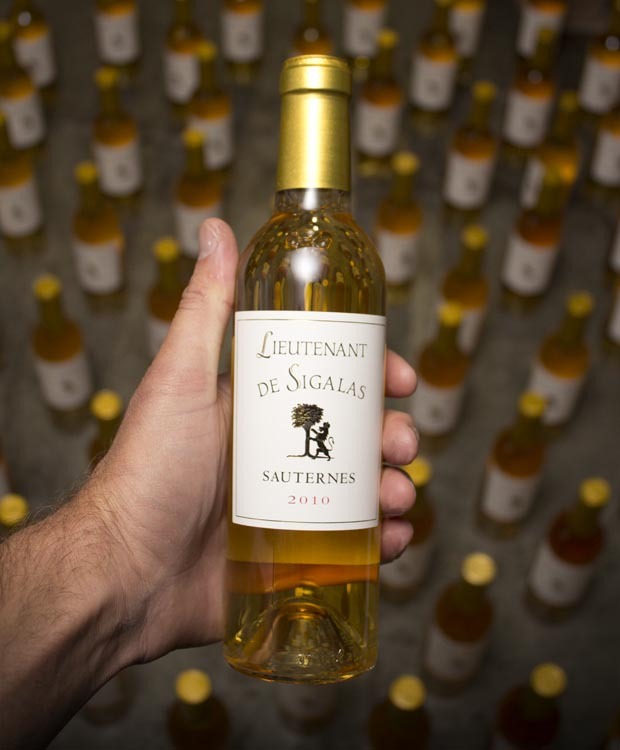 The de Lambert des Granges family, heir to Château Sigalas Rabaud, perpetuates their family’s legacy by respecting the terroir and the selection of the wines in order to produce a great Sauternes.